ArcGIS Pro Introduction (Zip Archive): Data and outline to go along with Library workshops. 1.Duke University students, faculty, and staff can get a free copy to install on their own Windows computer as long as they are affiliated with Duke. 2. OIT computer labs on the Duke campus with computers running Windows. 3. Virtual Computing Manager (VCM) from Duke's Office of Information Technology (OIT) allows Duke users to check out a virtual machine with ArcGIS installed and connect via a remote connection. 4. The Brandaleone Family Center for Data and Visualization Services is in Bostock Library, on the first floor (The/Edge). Windows only: ArcGIS runs only on Windows platforms. Users of Macs or other operating systems need to install virtual machine software to install ArcGIS in a Windows environment. Another option is the open source GIS package Quantum GIS (QGIS), compiled for several platforms. ArcGIS pro has two licensing options. The Named User License authenticates registered users through an organizational ArcGIS Online account. An ArcGIS Pro license must then be activated in your ArcGIS Online account..
Named User License: You must first set up your ArcGIS Online account, which relies on the Duke University campus site license. After setting up your ArcGIS Online account, email the administrtors to activate your ArcGIS Pro license: it@nicholas.duke.edu. Each time you open ArcGIS Pro, you will log in usnig your ArcGIS online credentials to authenticate you as a licensed user of ArcGIS Pro. Concurrent Use License: You must set this up from within ArcGIS Pro. See below. Instructions for each of these methods are below. 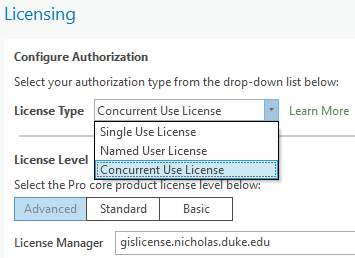 With a Concurrent Use License, ArcGIS Pro will check with a license server (gislicense.nicholas.duke.edu) each time you open it, in order to verify that you have a licensed copy. You will still need to create an ArcGIS Online account and log in to ArcGIS Online if you want to move content back and forth from ArcGIS Pro on your desktop and ArcGIS Online in the cloud. You may have an option to set up the license when you install the program. After installation, you can always change the licensing option from within the ArcGIS Pro interface. From the opening interface, you can choose the "About ArcGIS Pro" link in the lower left to get to the Project screen. OR from the project interface you can choose the Project tab to get to the Project screen. Then, from the Project screen, choose the Licensing tab. Then click on "Configure your licensing options" button at the bottom of the resulting screen.